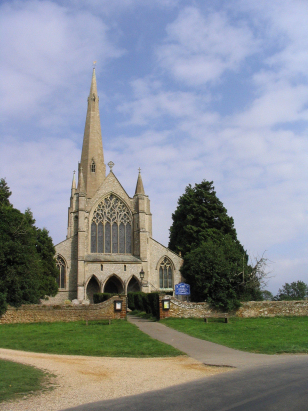 The parish of Snettisham lies in northwestern Norfolk, close to the Wash coastline and adjacent to (now thankfully bypassed by) the busy coastal road linking King's Lynn with Hunstanton. 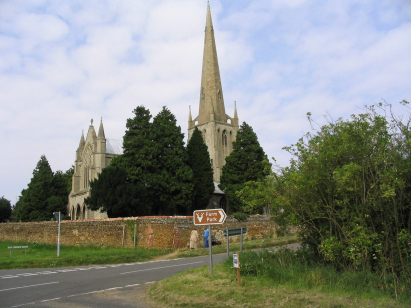 Snettisham is a substantial village, the core is alongside the old coast road with newer modern estates spreading towards the new bypass. The village is coastal but almost 3 miles from the Wash as there are extensive grazing marshes and mud flats to its west. The core of the village was strategically built on the old prehistoric shoreline, some 11 metres above sea level, and is thus relatively safe from the risks of flooding. St Mary's church is one of Norfolk's finest. A rare example of the Decorated style in its glory and rather early for a Norfolk church. It is also rare in Norfolk for possessing its elegant steeple a feature more associated with Lincolnshire across the Wash than Norfolk. Pevsner is fulsome in his praise of the architecture and in particular the great window that graces the view on the normal approach. The church is situated on higher ground still to the east of the main village in splendid isolation which shows it off to best effect. Three register books cover the period of the transcript. The first two are standard 800-entry registers and are filmed on Microfiche 4 to 7, the third, a 1600-entry register continues beyond the end of the transcript to modern times, is filmed on Microfilm MF1622 - all in the collection of the Norfolk Record Office. The first two registers on microfiche are from a very early filming and suffer greatly for that, the images are of poor quality and there is great difficulty in reading some of the entries due to fading and poor clarity - there had to be much reference to extant BTs to verify some entries. Fortunately the situation improves for the third register which is from the modern era of films and is a considerable improvement throughout. To summarise this was not a straightforward transcript to prepare with difficulties in the early two registers - complete accuracy is compromised as a result but hopefully has been minimised.